My alarm had just started (the constantly changing tone can only be described as diabolical) and I tried to turn over and silence it. My arm didn't make the trip. It was concrete and just as supple. 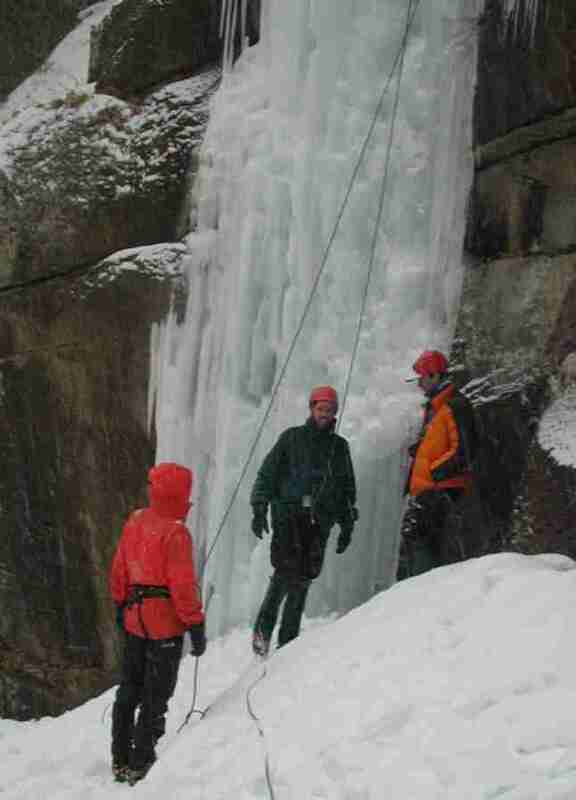 My first time ice climbing started badly. I was flailing around trying to get a feel for the picks and my crampons. My belayer was shooting machine-gun beta at me, all of it unsolicited. I was trying to process too much. My boots felt like fuzzy slippers. I couldn't seem to swing my left axe straight. I was a mess. I made it to the top after interminable periods of hacking and trying to implement various mutually exclusive tactics shouted from below. It was pure stubbornness. This was the "steep" ice class. All waterfall, all the time. No low angle stuff. So what was I doing in this class? I had volunteered to the registrar that I was a rock climber and was facile with crampons and a mountaineering ice axe. You can go straight to intermediate, he said. Are you sure? There should be no problem if you're up for it. I was in. Turns out I was the only first-timer there, and so I climbed first. It was almost a hazing. I knew I wanted to get that awkward first time out of the way, so I volunteered for the first run on the top-roped half-pitch. When I got down my hands were numb, but I had lots of adrenaline. I did a couple windmills to force the blood back into my digits and discovered for the first (and hopefully last) time just how painful that is. Oh my god. I was grimacing like a conscious surgical patient. Gasping and bug-eyed from the pain that would not cease. Some small rational part of my brain made me endure it and not break the decorum with a scream. Never again. I watched some others climb. There were 3 Dan's in the class. I was "Black Dan" after my black jacket. "Orange Dan" had driven in from Ohio and been my neighbor in the elementary school parking lot. I had noticed someone sleeping in their truck. He had noticed someone sleeping in their car. "Purple Dan", (my suggestion of "Lavender Dan" was resisted) was a young guy from right there in NH. He went up the longest route first, topping out where a couple others hadn't been able to. I decided to try the same thing. It was much better. The mental clutter was gone and I walked right up. Felt great. Next I wanted to try to stem over to a suspended pillar midway up the same route. This was accomplished, but in stemming against a smaller pillar I broke it off. A piece of ice more than half my size went flying. I screamed "ICE! ICE!" at the top of my lungs as I was hanging too tightly by my axes. Luckily no one was in the way and the piece caromed off the ground and crushed this guy's backpack. Just smashed it flat. His camera was unhurt, but only b/c it had been in the very bottom of the pack. His down jacket was thin as paper. I went up a bit and decided to come down. Simply topping out wasn't important to me. I wanted to do the cruxes and see what I was capable of. I already had an idea to try. There was a smallish pillar suspended above the ground over some mildly overhanging rock. The instructors had both come over and tried it. Both could do it, but the climbing was different. No hacking. Hooking and lightly stepping. It looked hard, but rewarding. It looked doable, but would be a stretch. I announced that I wanted to try it. Instructor Adam was enthusiastic, but then he was always enthusiastic. He belayed me. You have to reach up to hook one axe in a hummock, hang straight-armed off it to place your feet against the slight seam in the rock below. A pull-up positions the other arm for another hook, then another with the first arm. You can now bring your feet up again, but still on the rock. One more hook and an elbow stem to get the other leg up into a small hole near the bottom of the pillar. Any hacking motions (with either axe or feet) would have brought the whole thing down. I stepped up and found another hook far above. I was flagging with my left leg out on the rock. With the high hook, I was able to rotate my body and step above the other leg. From here it was straightforward up. Adam was whooping it up. Several of the other students were too. I was so pumped up (both arms and adrenaline) I don't recall what precisely they said. It felt so amazing to actually do some of what I've only seen in movies before. I'm sure I whooped too. Adam said I must be an incredible rock climber with that strength, but I set him straight. It's my weakness. Strength retards your route-finding and balance development. Sigh. But back to reality. I tried another problem: a curtain. It started under the ice with a sharp one-arm layback on an axe placed sideways in a rock crack. Leaning back on this you make the initial hook above where the ice ends. I tried to do the next moves with all arms. It was possible to use another portion of the curtain for a layback, but I thought I could hook up enough to reach the main portion with my feet. Not so. I didn't want to bail and I tried it for way too long, all on my arms. In the end I had no strength left and couldn't get my tools out. I had to abandon them to be lowered down, losing millions of style points. I promptly went up the side to get them. I waited a couple hours and tried one normal climb to keep warm (it was snowing the whole day). I was belaying Lavender Dan up the stem-to-the pillar route when a large chunk of ice slammed into my face. 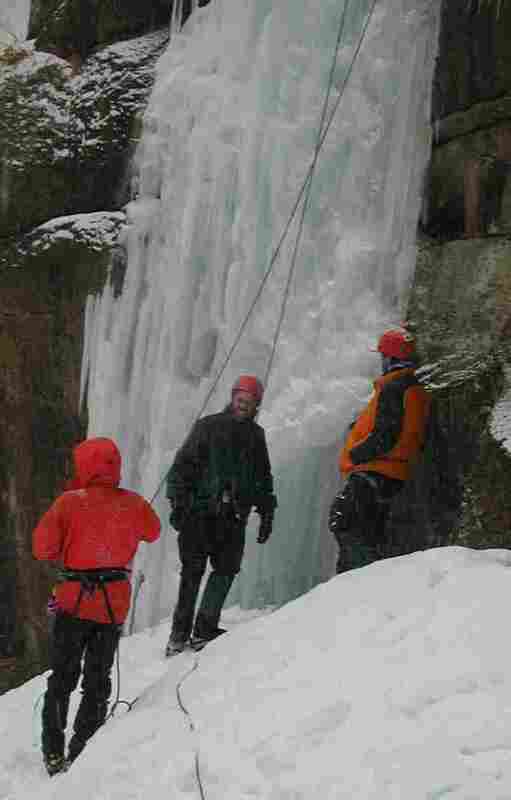 I knew my lip was busted and my whole jaw was numb, but I didn't lose the belay (ice-covered rope with gloves? the ATC doesn't give much friction, let me tell you!) Sure enough I had blood on my lip, but the numbness faded after about 10 minutes. Near the end, Orange Dan tried a mixed portion that started with a dry tool placement and a single flagged step up to catch a hook. He wasn't able to climb up from that, but it was the end of the day. I decided to try it as the capper for my day. I made my way up past the crux and then was too weak to continue to the top (actually I probably could have, but I was flailing about so badly it didn't seem worth it). The mixed stuff was quite entertaining. Exciting and engaging. I can definitely see myself climbing more of it in the future. I probably won't have the chance this year as winter is almost over (doh! stupid northeast!). Most important thing I learned: there's no shame in drinking beer with a straw b/c you lack the strength to lift the mug. I also enjoyed the slide shows each night. Henry Barber talked about his many failures. This was a real hit. He is in his 50s. A biography of him was published in the 70s. He didn't really have anything to say back then, but he does now. 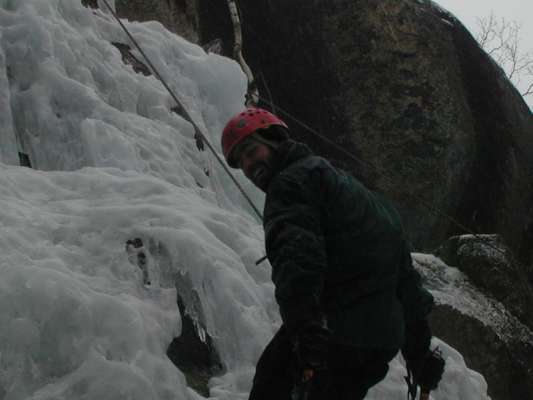 His specialty had been solo climbing and first ascents of radical ice. He had lots of good photos of places he had climbed, but the pictures he painted in your head were much more interesting. A trip to the Dolomites with a couple friends. The friends were climbing a 900 ft wall late in the day. The weather was shifting. Henry became restless and soloed up the 5.7/8 face after them. He passed them in the last 20% or so to stand alone at the summit. There was a slight sulphurous smell and a tingle in the air. An electric storm was coming in fast. The temperature had dropped precipitously. His friends were having to scrape verglas off each hold. He was in trouble. Normally he could downclimb, but not with verglas on the holds. When the leader buddy appeared, his hair was sticking straight out from his head. The stoppers were flying out horizontally from his harness. Watching his buddies, Henry thought about how, even though he had soloed up, his fate was in their hands. If they couldn't make it up to him, he was screwed. He showed a film from the late 70s of climbing Mt. Johnson in AK with Yvon Chouinard. They were on the Ruth Glacier with a couple Swiss guys. The climbs were amazingly wet and miserable. The rock turned crumbly about 2/3 up the route. They were able to saw it with a sling! At this point they decided to bail. The Swiss didn't want to go down, but went along. The weather turned and they were socked in for a week. The route still hasn't gone. On the wrong side of Kilimanjaro is a huge 1500+ ft face of ice with no recorded ascents. Henry and a long-time alpine and rock buddy tackled it. It took more than a day of low-angle ice climbing to get near the face. They bivyed on the ice a short approach from the start of the climb. Halfway up the hard climb, his partner took a bad fall and suffered a compound fracture of his leg. There was exposed bone and his "boot filled up with blood". They worked together to rap off and then worked out a dynamic self-arrest trip down the low-angle ice from the bivy site to base camp. Although they were working together, relations were strained in a way never seen before. Henry was pointing out how important it is to choose climbing partners carefully and to be objective in your evaluations. He had climbed with this guy for a long time, but ignored certain signs before the trip. Jim Donini detailed his many attempts in Patagonia on Cero Torre and Torre Egar (which he was the first to ascend in the late 70s). The weather. Oh my, but the weather he described makes what I've heard about the Aleutians seem like a picnic. On multiple 3 month trips, he got in about 16 days of climbing. Total. Another climber good enough to rate a slide-show of his own (first ascent of the west face of Cero Torre) put it more emphatically: "If I wasn't obsessed with Patagonia, I'd climb anyplace with better weather, and that's anywhere." It was fun to see the types of people who would come to an "Ice Festival". You had all types. The mutant machines who could climb a flagpole with no arms. The older guard there to check up on the youngsters (and maybe tell them a secret or two if they'd shut up and listen). The weekend warriors who pay the bills to get the thrills. And those couch Don Quixote's who can't stay home and watch golf, but aren't motivated enough to get in shape. And the impressionable kids who yearn to risk their lives the way all the cool people do. Frankly, just like all the stats say, I was in much more danger just getting to and from the fest. I labored 9.5 hours in a blizzard and sometimes zero viz to get to NH. When I left 3 days later, there was ice on the road for the first 100 miles. I remember thinking on the way home (in pea-soup fog) that the only atmospheric condition I hadn't encountered was lightning.